Walt Whitman. 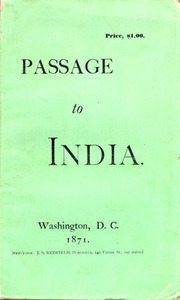 Passage to India. New York: J.S. Redfield, 1871. IN PASSAGE TO India, the title track in this 1871 collection of his "songs," Whitman seeks to reconcile the newest achievements of Western science with the oldest truths of Eastern religion, the "myths Asiatic." The book is included here to represent the period's fascination with "Oriental" thought, especially Hinduism and Buddhism. Emerson, for example, whose own passage to India was by way of German Idealism and British Romanticism, owned one of the nation's best collections of Eastern writing. Thoreau made extensive use of it, and in Walden indicates one of its major attractions to him and others in his generation. "As for the sacred scriptures, or Bibles of mankind," he writes, "who in this town can tell me even their titles?" In Walden he quotes liberally from Confucius and Sheik Sadi of Shiraz, the Bhagavadgita, and the Harivansa, both for their spiritual wisdom and as a way to defy and transcend the bourgeois world of Concord. In the 1960s, the children of the American middle class would turn again to the East. 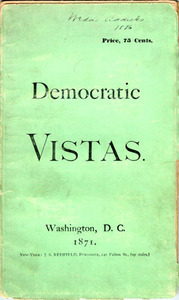 Shown is a signed copy of the first edition. WHITMAN WAS ONE of the few writers to keep the Emersonian faith in individual and cultural regeneration after the Civil War. How difficult that was can best be appreciated by reading Democratic Vistas, a prose work he published to protest the greed, corruption and spiritual failure of what, two years later, Mark Twain would label "The Gilded Age." In 1855 Whitman celebrated the United States as "essentially the greatest poem." In 1871 he admits that he must look to the future, must write "upon things that exist not, and travel by maps yet unmade" in order to see that newer world of consciousness. "But," he adds, "the throes of birth are upon us." Almost one hundred years later, at the end of Armies of The Night, Norman Mailer's account of the March on the Pentagon, America is still in labor: "America, once a beauty of magnificence unparalleled, [is] now a beauty with leprous skin. She is heavy with child . . . . she will probably give birth, and to what? . . . can she, poor giant, tormented lovely girl deliver a babe of the new world brave and tender, artful and wild?" 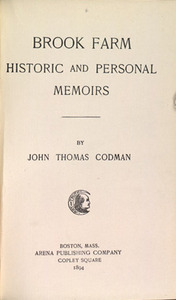 John Thomas Codman. Brook Farm: Historic And Personal Memoirs. Boston: Arena Publishing Co., 1894. 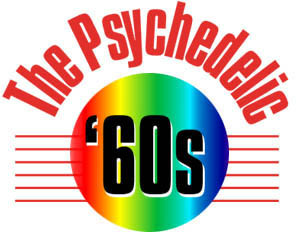 ALTHOUGH MANY MIDDLE-CLASS parents in the sixties feared the possibility that their daughter or son might decide to move into a commune, nothing could be more traditionally American than leaving conventional society behind to try to create a new community. Plymouth Plantation was the first commune. At the same time Thoreau moved alone to Walden, others chose to live outside the boundaries of conventional life, and closer to the truth, in radical communities. Brook Farm, founded in 1841 by George Ripley after he dropped out of the ministry, began as a Transcendentalist attempt to integrate the life of the mind with manual labor and ended six years later as a Fourierist phalanx. Codman went there in 1843, at the age of seventeen, and stayed almost till the end. Brook Farm was written half a century later, in large part to revive the memory of the experiment and inspire others to renew its attempt to better the world. He remembers that at Brook Farm he was entirely happy, living close to nature, working for the good of all, and "thinking of the unfortunate humanity who lived outside our charmed circle, [and] how much, how very much, of all our suffering comes from human ignorance only." Georgiana Bruce Kirby. 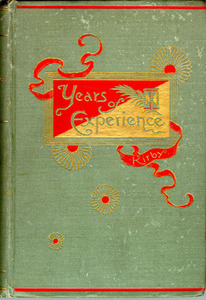 Years of Experience: an Autobiographical Narrative. GEORGIANA KIRBY WAS an Englishwoman who, as soon as she heard about Brook Farm, recognized that here was "the spiritual hospitality I had so longed for." Her years at "the community" form the central episode in her autobiography. Like Codman, she remembers her life there in utopian terms. In particular, she eulogizes it as "a grand place for children," especially because it was free from "false [class] distinctions: "with us, farmers', artists', sea-captains', and cooks' children found themselves on the same plane of opportunities." The road she traveled to get to Brook Farm she calls "the bridge which led me to the new era." Writing in the Gilded Age, she believes more than ever in the example of Brook Farm, in "the present necessity for a reorganization of society on a just basis." Given the way America has grown more unequal and unjust, however, she fears the only road to such a future now leads through violent revolution. Nathaniel Hawthorne. The Blithedale Romance. Boston: Ticknor and Fields, 1852. THE MOST FAMOUS ­ and least likely­ participant in the Brook Farm experiment was Nathaniel Hawthorne, who spent a year there shoveling manure and working in the fields. Hawthorne's biographers have never been able to decide what led him to join his reclusive and conservative temperament to this wild utopian scheme. 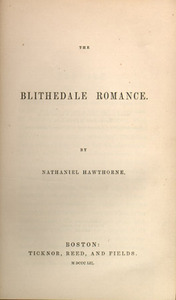 Ten years later he used the experience, which he called in the preface "the most romantic episode in his own life," as the occasion for The Blithedale Romance. Near the beginning we learn that the communicants at Blithedale "had left the rusty iron frame-work of society behind us, for the sake of showing mankind the example of a life governed by . . . familiar love," rather than "the false and cruel principles on which human society has all along been based." On the other hand, the story his narrator, Miles Coverdale, tells of doomed reformers, betrayed sisterhood, inherited fortune (and misfortune), and "Arcadian affectation" is an ironic valedictory to the possibility of a new heaven and a new earth. "As regards human progress," Coverdale writes in the last chapter, "let them believe in it who can, and aid in it who choose!" Bronson Alcott. 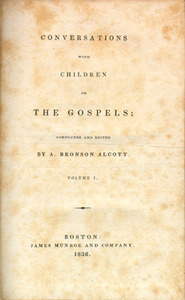 Record of Conversations on The Gospels, Held in Mr. Alcott's School. Boston: James Munroe & Company, 1836. IN 1843 BRONSON Alcott organized his own utopian commune, called "Fruit lands" for its commitment to vegetarianism. In a gentle satire on her father's idealism called "Transcendental Wild Oats," Louisa May Alcott, a year of whose childhood was spent at this short-lived commune, suggested a better name for it would have been "Apple Slump." If Emerson was the most popular prophet of cultural change, Alcott was perhaps the purest. In 1836 he opened an elementary school on Boston's Fremont Street. His idea of "teaching the children well" was devoutly Transcendentalist, doing away with physical discipline and rote memorization, helping each child discover and express the greatness already within her or him. In Conversations on the Gospels he hoped to prove not only the success of his pedagogy, but also the real value of Christianity ­by showing how the hearts of children already contained the truths of the New Testament. He naively called this book, published December 23, 1836, "Volume One." Volume Two was never published. By February, 1837, the book was under attack in the Boston papers. The Courier, for example, quoted a "noted clergyman" who called Alcott's teaching method "one-third absurd, one-third blasphemous, and one-third obscene." Although Emerson wrote the paper to point out that Alcott's goal was simply "to make children think," Alcott himself was hooted in the streets and alarmed parents pulled their children out of the school, which soon closed. On the other hand, Elizabeth Palmer Peabody, his assistant at the school, went on in 1860 to open the first kindergarten in America, and the kind of educational reform that Alcott believed in was reborn in the sixties­though its pedagogy was then and remains controversial.